At least nine million fish have been killed by diseases, botched treatments, poor handling and other problems at salmon farms around Scotland since 2016, according to official returns. Caged salmon companies have reported over 760 mass deaths to the Scottish Government in the last three years. In the worst cases, some fish farms and hatcheries lost a fifth or even a half of their stock. Campaigners say that the figures, analysed by The Ferret, expose the “shocking reality” of the fish farming industry. They are demanding tougher regulation and a halt to expansion plans. Salmon companies accept that mortalities are too high and that losses can be “devastating”. They say they are investing heavily to improve survival rates, which are much higher than for wild salmon. Every month companies voluntarily report incidents to the Scottish Government in which hundreds or more fish have died. The data is recorded and published online in a large and expanding spreadsheet, which is regularly updated. The latest version, updated on 29 March, shows details of 763 incidents in which a total of 9.3 million fish were reported dead. There were 361 incidents killing 4.5 million fish in 2017 and 308 incidents killing 3.4 million fish in 2018, with other mass salmon deaths in 2015, 2016 and the first two months of 2019. The actual totals of fish that have died prematurely on salmon farms will be higher. Companies have not disclosed the numbers killed in 126 of the reported incidents. The commonest causes of death were reported to be diseases. They included amoebic gill disease, salmon gill pox virus, proliferative gill disease, cardiomyopathy syndrome, pancreas disease, anaemia and fungus. Other frequent killers were “treatment losses” from misusing chemicals or de-licing machines, “handling” errors, algal booms, jellyfish, seals, “poor water quality” and oxygen shortages. Most of the dead fish have been transported south to be burnt in an incinerator in Widnes, near Warrington, in northwest England. Some have been incinerated in Shetland, or buried in pits. The highest number of salmon deaths were reported by the Canadian company, Cooke Aquaculture, and the Swiss-owned Scottish Salmon Company, who both recorded 2.5 million mortalities. Two Norwegian-owned firms, Mowi (formerly Marine Harvest) and Scottish Sea Farms respectively reported 1.7 million and 1.2 million deaths. Although the total reported salmon deaths dropped by over a million between 2017 and 2018, mortalities at four companies increased. Deaths at Lakeland Smolt’s Cairndow hatchery on Loch Fyne rose from 60,000 to 539,000, while deaths at Mowi farms rose from 667,000 to nearly a million. There were smaller increases between 2017 and 2018 at fish farms run by Loch Duart and Grieg Seafood. Many of the highest mortalities were at freshwater hatcheries where salmon are small and more vulnerable. Over a half a million fish were reported dead in one incident on 14-15 August 2018 at a new hatchery run by Mowi at Inchmore in Glenmoriston. According to the government spreadsheet, that was a 28 per cent mortality rate and was due to “oxygen supply failure”. Warm water at Cooke Aquaculture’s Loch Garasdale hatchery on the Mull of Kintyre killed 150,000 fish in July 2017. Trucks transporting them from another site were delayed by a road accident. At another Cooke site at Mid Taing on Shetland two salmon cages suffered mortality rates of 12-15 per cent in September 2018, “following hydrogen peroxide treatment for amoebic gill disease”. At a Scottish Salmon Company farm on Loch Odhairn on the Isle of Lewis there were deaths in January 2018 due to “suspect cardiomyopathy syndrome”. But the company was “unwilling to disclose the percentage of the mortality or the number of fish involved”, according to government inspectors. The salmon farming analyst and critic, Corin Smith, accused the industry of “a pile ’em deep, treat ’em cheap” mentality. Between 2002 and 2017 the mortality rate on Scottish salmon farms had risen fourfold while the tonnages of dead fish had increased fivefold, he said. “If we saw fields of sheep, cattle or pigs with 50 per cent of the stock dead people would be going to jail. Instead our government ministers hail open cage salmon farming as the most sustainable industry,” he told The Ferret. The Scottish Greens demanded a ban on new fish farms. “The suffering and deaths are inexcusable, yet the Scottish Government still dithers when it comes to regulation and continue to stand by industry plans for massive growth,” said the party’s environment spokesperson, Mark Ruskell MSP. The Scottish animal welfare charity, OneKind, pointed out that fish were sentient animals capable of feeling pain. “This new data shows the shocking reality on Scotland’s fish farms where millions of fish are reported dead or disposed of,” said the group’s director, Bob Elliot. The wild fish group, Salmon and Trout Conservation Scotland, also backed a block on new salmon farms. It highlighted a recent report by MSPs suggesting that farms with excessive mortalities should not be allowed to expand. “The need for the moratorium on expansion, that the Scottish Government opposed and continues to oppose, has never been more clearly illustrated,” said the group’s solicitor, Guy Linley-Adams. The fish farming industry agreed there were problems but stressed that it was addressing them. “Losses can be devastating and no farmer wants to lose the stock they have reared,” said Julie Hesketh-Laird, chief executive of the Scottish Salmon Producers Organisation (SSPO). She added: “Mortality levels are higher than anyone in the sector would like and Scottish salmon farmers are working collaboratively, investing significantly to improve salmon health and welfare, and to overcome the complex challenges that can lead to such losses. Mowi Scotland pointed out that salmon were cared for over three years, and farmers wanted to see them all survive to market. “We have been very open about our efforts to overcome the challenges to salmon survival, that may include weather, health and predators, and is similar to what any farmer may face,” said the company’s communications director, Ian Roberts. A risk register in Mowi’s 2018 annual report highlighted that salmon deaths caused by diseases led to increased costs. “Continued disease problems may also attract negative media attention and public concerns,” it said. Ralph Bickerdike, head of fish health at Scottish Sea Farms, said: “We invest on a huge scale – time, thought and money – to pre-empt and prevent the challenges presented by the marine environment. The Scottish Salmon Company stressed that health and welfare was fundamental to responsible farming. “Like any farming there can be naturally occurring health challenges,” said a company spokesperson. Loch Duart’s managing director, Alban Denton, described statistics taken from the government’s spreadsheet as “isolated” and “historical”. They “do not reflect our current experience,” he said. Cooke Aquaculture refused to comment, while Grieg Seafood, Wester Ross Fisheries and Lakeland Smolt did not respond to requests to comment. The Scottish Government pointed out that the fish farming industry contributed £620 million a year to the Scottish economy. There had been a “deterioration” in fish survival up to 2017 but it was now improving, it argued. 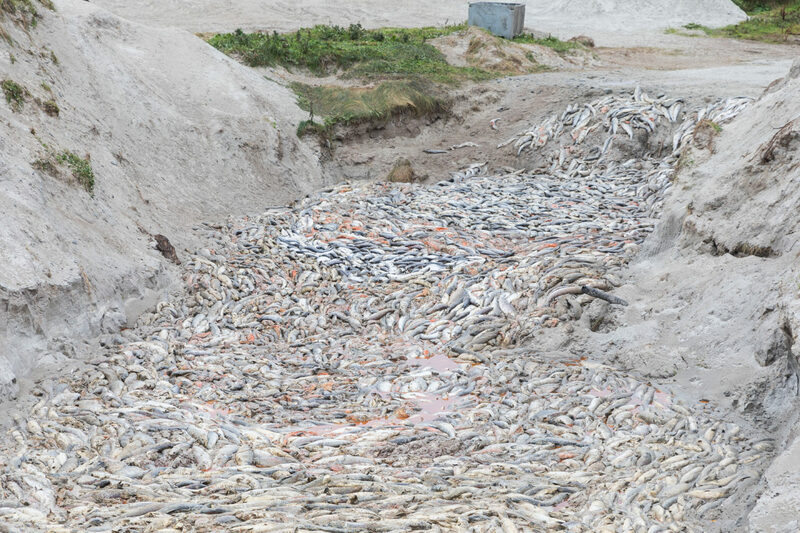 “Mortalities are, of course, to be regretted – but they happen for a wide range of reasons, with some connected to fish health,” said a government spokesperson. Graphics and data handling thanks to Alastair Tibbitt and Alastair Brian. 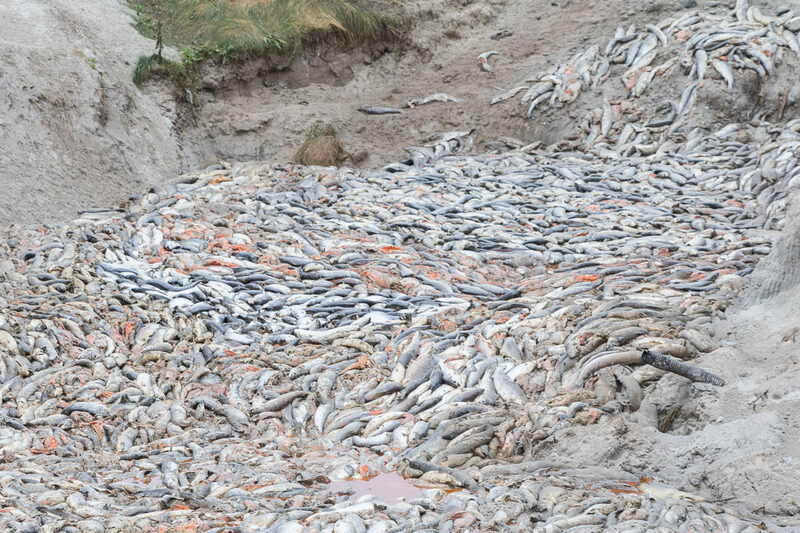 Photos of dead salmon dump in North Uist thanks to Corin Smith. This story was published in tandem with the Sunday National.